Perfect for the top of a dresser or larger chest, this elegant mirror presents exquisite style and design for your bedroom setting. Featuring a wood frame with a dark brown finish, the rectangular mirror adds a wonderful accent to any transitional room setting. The 1017 Mirror with Wood Frame by United Furniture Industries at AHFA in the area. Product availability may vary. Contact us for the most current availability on this product. 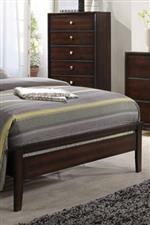 These beautiful furnishings will transform your bedroom with transitional style. Sleek with contemporary accents, the collection features extended storage, a unique bed panel headboard design, and exquisite drawer knobs. 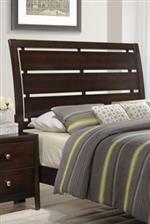 Completed with a dark brown finish, these furnishings present transitional style that is perfect for your modern bedroom setting. The 1017 collection is a great option if you are looking for Transitional furniture in the area.